JK Extreme Duty Trans-Mount Crossmember 07-11. Replace your JKs weak Stock transmission crossmember with the Poison Spyder Extreme Duty Crossmember! This ultra-beefy crossmember is constructed of two pieces of CNC laser cut, precision brake-formed 3/16 inch plate steel. Check out the damaged Stock crossmember in the photos below. When getting high-centered on the rocks, with the entire 5,000+ pounds of a trail-ready JK resting entirely on the crossmember, it can tend to bend upward in the Middle, or as we say, Taco. The double-wall sides of the Poison Spyder Extreme Duty Crossmember put the extra strength where its needed Most to prevent the Taco-effectin the side walls of the crossmember. 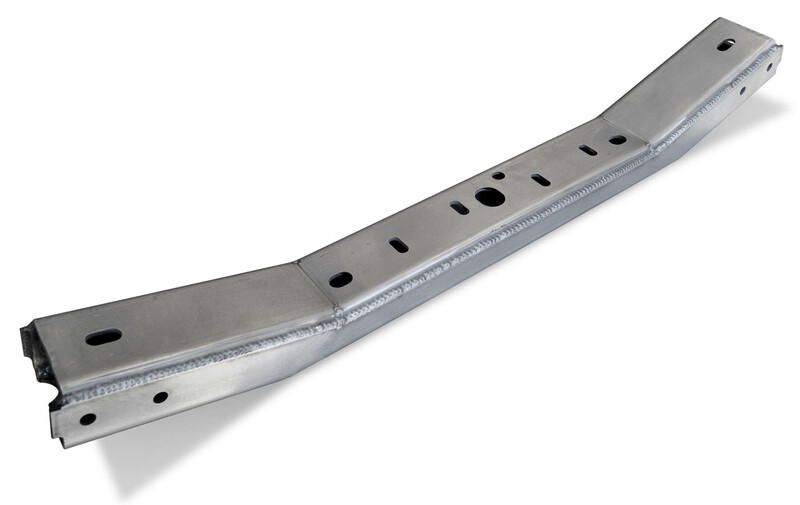 The 3/16 inch (.188 inch thick) top plate and bottom plate provide far superior protection against dents and bends than the Stock crossmember, which is made of a piece of 1/8 inch (.125 inch thick) and 14-gauge (.083 inch thick) stamped sheetmetal. Incredibly, the Chrysler engineers decided to put the much thinner 14-gauge piece along the bottom, making it crumple at the mere sight of rocks. The steel used in the Poison Spyder crossmember is 33 percent thicker on the top plate, and 2.5 times thicker on the bottom plate. And the 3/16 inch steel plate of the Poison Spyder Extreme Duty Crossmember has brake-formed corners all the way aroundthere are no welds on the box corners. Inside the crossmember, Poison Spyder fabricators have welded in four DOM tubing spacers to provide crush-proof strength at the crossmember mounting bolt locations. These are made of .120 inch wall DOM tubing. Compare that to the Stock crossmember, which uses stamped sheet metal spacers. The Poison Spyder Extreme Duty Crossmember matches the external dimensions and bolt locations of the Stock crossmember. All Stock skid plates that were attached to the Stock crossmember attach to the Poison Spyder Extreme Duty Crossmember. Any other manufacturer aftermarket skid plate system that attached to the Stock crossmember should still attach to the Poison Spyder Extreme Duty Crossmember. The Poison Spyder Extreme Duty Crossmember is shipped as bare steel, ready for you to paint or powdercoat in the color of your choice. This part number is for year model 2007-2011 JKs, both 2-door and 4-ddor, with either manual or automatic transmission.